That's what we're having at the moment. It was in the 20s when I went out in the front yard to take these pictures. I just HAD to because this doesn't happen here often. 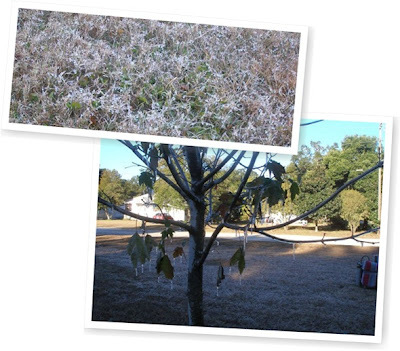 As a matter of fact, I think it's the first time I've actually seen ICICLES on the plants/trees since I moved here. I could hear the crackling noise of the icicles on the grass while I was walking across the yard...it's like stepping on broken glass...LOL. Anyway, I just want to share the pics here. Maybe next time I post it'll be snow. Oh my....now, that will the day. HI MommyWham, yeah I know its been a while. Life has been so busy here. Glad to hear from you again. I don't blog hop anymore. Hope you all have a Merry Christmas and Happy New Year too. So those are only icycles huh? Not the real snow yet? Exciting yan Huling!! Kayanin ko kaya ang lamig dyan sa nipis ng katawan kong ito? Reading your post pa lng, nilalamig na ako eh. ha ha..
kami kaya dito. grabe at ang ginaw!!! good thing,I have the option to just stay home. yung elliptical nagamit mo na ba? ako hindi ko kaya at suko ako diyan hahaha. I know that it may take a while to get used to it, parang inclined treadmill din(buti sa treadmill legs lang ang masakit) but tamad ang lola mo hahaha.